Expressive landscapes of the artist, written in a realistic manner, fascinate the untouched beauty of nature and the breath of space. 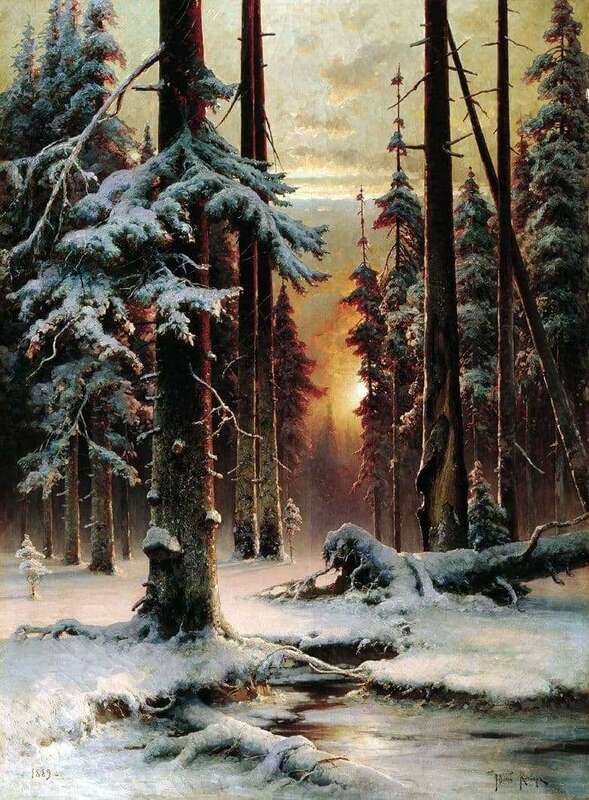 “Winter sunset in the fir forest” has become very famous in Russia and abroad. His reproductions are used in drawings for embroidery, on the pages of calendars. This picture was painted in a series of similar landscapes. All of them had a common feature – this is a detailed elaboration of the foreground and blurred outlines of the background and long-term perspective. Old fir trees froze on a snow blanket, in the silence there is not the slightest breeze. Winter forest lurking, waiting for the onset of heat. For now only the sunlight gets through trunks and serves as a reminder of a distant summer. Frozen creek rejects sun glare on the snow and the roots of the everted tree. The fallen giant almost completely disappeared under the snow cover, but the stubborn roots still stretch to the ground in a vain attempt to grab it. The rays of the winter sun illuminate the snowy space, leaving fancy shadows on the ground and tree trunks, and enlivens the landscape with a game of shades. Ice flames gleam on the surface of a sleeping stream, and a string of ancient trees stretching into the distance, in some places alternating with young trees. Calm and amazing beauty of nature gazing from the wizard. A thin strip of clear sky fascinates the fading blue. so noticeable on a background of white snow. No deliberate details, only the forest and the stream, and the sun peeking through the haze of clouds. The artist admires the Russian forest, from which blows eternity and immutability.